1972 Mego 8 inch Action Figure- Superman Type 2 tight joints. Condition is Used. Shipped with USPS First Class Package. His head is a little dirty. Clothes have a few rips. Joints and body are nice. Condition is Used. Hands are missing. Stain on clothing on chest and small hole on one toe. Like most the chest decal is missing but boots and everything else is there. Displays very nice. Made of vinyl material. These are Pre-cut on Vinyl. Better than the original decal. The stickers are more vibrant and look better in person. THESE EMBLEMS ARE ON GLOSSY STICKER PAPER AND YOU WILL NEED TO CUT THEM YOURSELF. 1972 Mego 8" Action Figure- Superman. Condition is Used. Please see photos for condition. Missing s logo Shipped with USPS First Class Package. 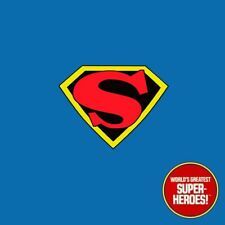 DC Comics Superman New 52 14 inch MEGO Figure Officially licensed IN STOCK! Raised with high moral ideals, Superman uses his incredible strength, speed, flight and various other superpowers to fight evil and protect the innocent. He is the most powerful being on planet earth. The belt seems slightly frayed on one edge. Original 1970's Mego 8" Type 2 SUPERMAN Action Figure - NICE! The body is all original with no cracks or breaks. The top snap is not attached but is still present. The emblem and boots are reproduction. The head has to be taken off the body to turn and pose then firmly placed back on the body. The head is not broken and will not fall off the body, if secured firmly. Custom Head, Body, and Suit. Custom Display Box. Joints all good - holds a pose. One split in left wrist joint, still firmly in place and functions normally. Crack in right arm near the elbow, still firmly in place and functional, just handle/bend with care. Also, his red rubber shorts are ripped in the crotch area. Since weall have different definitions of "mint", "good" etc. Joints are firm like you would want. Outfit shows minor wear as pictures will show. Missing emblem. Original cape is in nice shape. Very Minor paint loss to head and face. 1 elastic stirrup on 1 leg only. Uniform has pen marks on shorts/under emblem. Die-cut repro emblem. I hold the exclusive rights to all my images and texts, usage is not permitted. Clean tight body. VINTAGE MEGO SUPER HERO ACTION FIGURE 1973 DC COMICS MR MXYZPTLK / JOKER /ROBIN. All (3) for one price. all are functional nothing broken. Only issue is minor stain on Robin cape and its pealing. Condition is Used. Shipped with USPS First Class Package. Joints all tight - holds a pose. It's still firmly in place and functional. Displays nicely! Reproduction chest "S" sticker with bonus cape sticker. Since we all have different definitions of "mint", "good" etc. 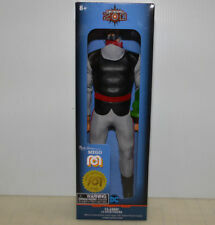 Nice condition donor body for Acama Toys X-Changers line, Battle Hawks figure. Some ab and chest skuffs, but is really nice and tight. Again, really nice donor figure! Original Cape is in excellent condition overall with minimal fraying confined to the outer-most edges only. Original Emblem is in PRISTINE condition, has lost adhesiveness over the years so is loose but could easily be reattached by new owner. ALL ORIGINAL & NEARLY COMPLETE 1970's Mego DC 8" Superman Action Figure WOW!!! Cape is in well played with condition, exhibiting significant fraying. Original Boots exhibit wear, including a small hole by the toe area on one boot. Arms/legs held in place firmly - good body elastics. Displays excellent and nearly all original! Original cape has minor edge fraying. Reproduction shoes/slippers look just like the originals. Finished off with custom repro "S" cloth sticker! This is for Marty Abrams Certified Collector Seal #4566 of 8000. See photos for exact condition. His cape and underware have color fading. In very good condition. S insignia missing. Slight fraying on cape light staining on suit. 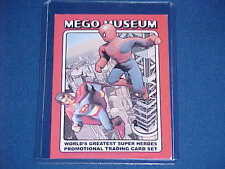 NEARLY ALL ORIGINAL & 100% COMPLETE 1970's Mego 8" DC Superman Early Issue RARE! Original Boots are in PRISTINE condition. Emblem is a reproduction and, thus, in excellent condition. Arms/legs held in place firmly - good body elastics. Displays excellent! Reproduction cape has no fraying! Repro belt and shoes/slippers look just like the originals. Finished off with custom repro "S" cloth sticker! In good condition. The top left corner of the plastic is dented in a little bit. Overall still a really great collectible! Joints all great, holds a pose and no cracks. Arms/legs held in place firmly- good elastics. Very minimal fraying on cape edges. Stitched belt in place and looks great. Original boots look excellent with no cracks or splits. World's Greatest Super Heroes Superman DC Comics Loose Figure Mego 1977 8"
Joints all tight - holds a pose. Displays nicely! Reproduction chest "S" sticker with bonus cape sticker. Since we all have different definitions of "mint", "good" etc. Belt looks good, firmly stitched in place. Joints all good, holds a pose. Very rare first release smirking/smirk version. As a result, we usually see the more common "open mouth" version. Original Head: Marked 1973, great skin tone and clean. Original 1970's Mego 8" SUPERGIRL Action Figure - VERY NICE! The body is all original with no cracks or breaks. The head is original and shows almost no signs of wear. The outfit is original and shows only very minor signs of wear. The chest emblem, cape, belt, and shoes are reproduction. Die-cut repro emblem. Early uniform nylon shorts. Hair paint rub/front. I hold the exclusive rights to all my images and texts, usage is not permitted. Sold as is. Excellent condition. Emblem, Shoes & Cape are reproductions and, thus, in excellent condition. Nice used outfit, with nice cape! make Supersized seem small. see the difference between an original piece and a reproduction . As you can see in the picture he has a split in the back of his boot. Other than that he looks great! This rare head is referred to as the "comic" version and I think it was mostly sold on the foreign markets. The 12" Superman that most of us are familiar with has the Christopher Reeve head sculpt. This head looks very different, nothing like the actor. RARE! Superman classic 1979 Mego Die-cast Super Heroes Figure Vintage Loose. Condition is Good. He is TYPE I. Minor paint loss and discolorstion on head. He displays great and holds a pose just fine. 1979 MEGO SUPERMAN 8" Action Figure! DC Comics Super-Heroes. - MOC! 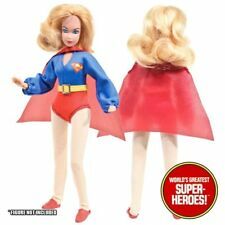 *ORIGINAL* Beautiful Mego SUPERGIRL Super Gals WGSG WGSH 8" Action Figure!